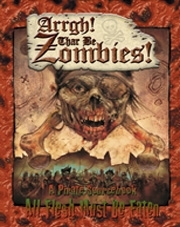 Zombie Week continues here at Flames Rising with a new interview about zombies…and pirates! In this interview, FlamesRising.com got the chance to sit down with Daniel Davis. Daniel is a hobby games designer who has worked with Eden Studios on the game line All Flesh Must Be Eaten. Today we talk to Daniel about his experiences with this zombie survival horror game and his work producing the Arrgh! Thar Be Zombies game supplement. Be sure to check out the Arrgh! Thar Be Zombies! Preview we posted earlier this year. How did you get started with All Flesh Must Be Eaten? It sort of began with spying it on a shelf at a local game store. I probably picked the book up and looked at it a half dozen times in various visits. I was intrigued by a zombie survival horror style game, but at the time I was playing other things and didn’t have the money for another game title I wasn’t sure I’d ever get to play. Finally I said that if it was there the next time I stopped in, I’d pick it up. It was. I did. And I’ve been hooked on Unisystem ever since. All Flesh Must Be Eaten (AFMBE) is always my go-to game. It’s just massively versatile. I’ve run bout everything with it. After buying the book I looked up the All Flesh Must Be Eaten website and saw that there was a community you could join, the AFMBE mailing list. I got on there and met some pretty cool people, wrote up a bunch of fun bits of rules and gear and Aspects and such and joined in on some of the list projects. It was probably, in part, my zeal for writing up new material that got me started writing in a more official capacity for Eden Studios. What can you tell us about your other Eden Studios material? I’ve written mostly AFMBE material, but it started with the character write-ups in the back of the Matchsticks comics. It was a short-lived comic collaboration between Eden Studios and Dan Masucci and Francis Hogan. They were fun to do, but I don’t know what ever happened with that. It’s a shame it disappeared. I was just starting to get into ‘em. Then I picked up the job of writing the D20 material in the back of the AFMBE revised book. They wanted AFMBE conversion material for D20 Modern. It was interesting to tear down the D20 rules to see how they ticked, so to speak, and convert the Unisystem rules over. It’ll allow you to run AFMBE in D20 and create AFMBE style zombies for anyone still playing 3E, which is a pretty nasty thing to do to your 3E AD&D players. After that was the Odyssey Prime conversion rules, allowing you to play Misfit Studios’ Odyssey Prime in Unisystem, which is loads of fun. I’ve also had a couple Deadworlds, Silver and Aces High, published in One of the Living and Worlds of the Dead, respectively. Silver is a post apocalyptic Deadworld dealing with a recreational nano-drug that gains self-awareness and goes out of control, and Aces High is a WWI flying Ace style Deadworld. I had actually written that one some years before because Eden asked me to write up a Deadworld that showcased aerial combat. Evidently they’d had folks asking how you could use the dogfighting rules in a zombie game. Eventually it made its way into a book. However, Arrgh! Thar Be Zombies (ATBZ) was my first big project. What were some of your inspirations for Arrgh! Thar Be Zombies? In a more general sense, probably the slew of both pirate films and zombie films that I’ve seen that would have easily benefited from a mash up. However, there are a few inspirations that I guess stand out. On Stranger Tides by Tim Powers is a big one. It’s got pretty much everything in it, pirates, Vodou zombies, Vodou Fetishes, Loa, sword and ship battles. It’s an awesome book and some of my thoughts reading that book did sneak their way here and there into Arrgh. The Princess Bride, is another. It’s one of my favorite films and was partly responsible for the rules for Dueling. Oddly enough, Treasure Planet was another. And then as the first Pirates movie came out I really felt like I had to find a way to incorporate some of that into the book as well. Some of the new zombie Aspects especially, you can see the PotC influence. There were some others, but I think those were the ones I kept going back to in my mind. What were some of the challenges putting this book together? I did a LOT of research for the book. I knew a bit about pirates, but to do proper justice to the book I really felt that I needed to learn a lot more. I’d say the three biggest challenges were finding good information on the various ships in the Age of Sail, finding extensive and reliable information on Vodou, and fitting as much as I could into the book. In fact, every time I went to research something I probably found two more things that I felt like I had to add. There are more things that I didn’t add that should be out in a web enhancement eventually. It was a lot bigger undertaking than I first thought it would be, but I think it turned out well. Another big challenge was trying to make sure all the rules worked with already established rules in other Unisystem books. That’s a lot of stuff to go through and keep in mind when working up rules, but it has to be done to keep everything as consistent as possible. How many new Qualities and Drawbacks can we find in this book? There are a couple that have been re-tooled for the setting and one or two from other more “cinematic” lines, but there are quite a few overall. A couple I had actually come up with for another supplement idea, but they also fit quite well in the pirate setting, Disconcerting Countenance, for example. There’s a good 10 new Qualities, give or take, but not as many Drawbacks, about three or four. However, I think the new Special Skill, Florentine Fighting Style, is one of the biggest additions and works rather well for the cinematic sword fighting feel. The fights we had in our game group using that were crazy fun. How well does this book cross-over with other AFMBE supplements? Very well, I think. I wanted to try to make it as versatile as I could so that everyone could find at least something they could incorporate into their games. It’s a perfect pairing with Dungeons & Zombies. Doing a Wild Coast type setting or something like. I think you’d just need catapults and Ballistae. Then again, some of the smaller cannons could probably be converted and used as catapults with some tweaking. I think ATBZ works well with All Tomorrows Zombies too. The info for using Aspects, Qualities, and Drawbacks for ships would make for interesting starship quirks, or even for living ships. And you can look to films like The Ice Pirates for examples of pirates in space. And then, of course, there’s the Islands in a Dark Sea type setting. Enter the Zombie? Wuxia martial-arts swashbuckling action? Zombies that can reload the flintlock that’s grafted into their hand with the lead shot they’ve just been hit with? Yeah, EtZ and ATBZ’d be great together and there’s plenty of crossover potential. With Fistful of Zombies, you’re hitting the tail end of the Age of Sail with the Wild West, but there’s nothing to say you couldn’t have six-gun toting desperadoes at sea. And there’s several things that can be used in a Wild West setting as well. Cannons to protect forts, several Qualities that’d add pizzazz to any “Man with No Name,” rules for being inebriated, and quite a few of the diseases in the Age of Sail were still around in the 1800s. Oh, and with a little renaming, the Vodou rules might make for interesting Native American shaman abilities. Pulp Zombies could add a Steampunk style flair to your pirate setting with the Gadget rules, taking it in yet another direction. And a pulp style pirate excursion to the wilds of South America would be awesome. There’s even quite a bit in ATBZ that could be incorporated into a modern setting, like the old diseases that would spring back up with a lack of proper medicine and hygiene and such. There’s also some foraging rules in the supplement that could be used in a modern setting. And without fuel, sailing ships could make a comeback. Then again, why not mix a bunch of ‘em and have six-gun toting desperado elves sailing the seas of fate on ships protected by energy shields and armor, with Kung-Fu monks and religious mystic companions at their side while fighting off undead marauders from another dimension who wield strange weaponry that fire beams of light. Whew! That’s a lot. There’s a web enhancement that George will eventually be adding to the site for ATBZ that gives a little more info on the crossover potential of not just the AFMBE line, but other Eden products as well. What can you tell us about the new Deadworlds in this book? Well, I wanted to try and keep the dark feel to as many of them as possible, keeping with the survival horror roots of the game line. I knew that I wanted Vodou to play a role in at least one of the Deadworlds and that ended up being Voodoo Queen of the Shrouded Isle, which I think is also the bleakest setting. I’d actually written another setting, but it wasn’t quite enough of a true Deadworld, so I cut it and I think it was Voodoo Queen that I ended up replacing it with. The Black Fleet was inspired a bit by Pirates of the Caribbean, as in there’s zombie pirates that just don’t seem to stay dead roaming the seven seas searching for a cursed Crystal Skull that will allow them to rest. However, they’re also sort of plague bearers, in that occasionally those they kill will return as undead crew, though thoroughly villainous and still free to roam and cause destruction. To top it off, the Crystal Skull is oozing chaos across the countryside as it moves from owner to owner and creating havoc. Islands in a Dark Sea had a number of influences and came about because I wanted to show just how far the supplement could be taken and wanted to do something big with Essence. In fact, some of the rules in there can be ported over into a straight sci-fi setting. It pulls influences from various places: a couple older RPGs that I’d never played, but found intriguing, Treasure Planet, Steam/Aether Punk, an anime or two, and there was an odd little sci-fi film from 1979, I think it was called Message from Space, which had a sweet looking starship that looked like a sailing ship with engines. It was a cheesy film, but I do likes my cheese. I think it was the most fun of the three Deadworlds to write. The two shorter ones in Pieces of Eight were done for a couple of reasons. The Tay-Son Rebellion setting came about when I started reading about the pirate gangs of the seas around China, Vietnam, and Japan. These gangs were massive and organized, like the Triads or Yakuza, but sea faring. This is a big playing field, not only as pirates, but on land as well, since there’s the whole backdrop of a war going on. It was a perfect setting to have a Lo-Pan style Zombie Lord and would be great mixed with Enter the Zombie. The Aztec Lord’s Curse was created because it was mentioned that it would be a shame to do a pirate book and not have an Aztec curse/exploration type setting. Last, the Dead Men’s Tales were just two short adventure ideas that popped into my head while writing and wouldn’t go away and I couldn’t find a place to drop them into the other settings. I figured they might make for a good night of adventure or a jumping off point for a ZM who needs a place to start their campaign. And I guess I got a bit long winded. Tends to happen with me. ARRGH! Thar Be Zombies is available now at the Flames Rising RPGNow Shop. Band of Zombies from Eden Studios available now! Eden Studios to Bring Hack/Slash to Gaming!